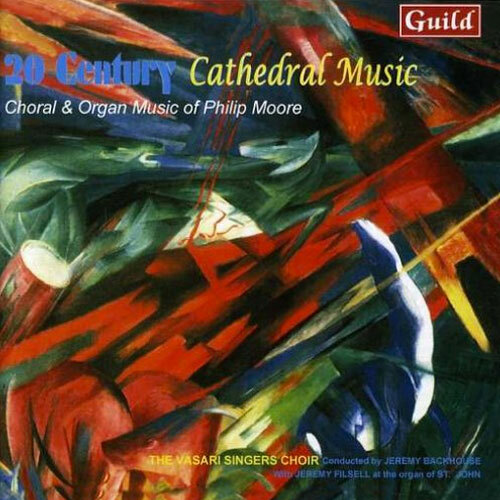 Philip Moore: 20th Century Cathedral Music – American Record Guide - The performances on this disc are superb. Philip Moore is Organist and Master of the Music at York Minster. He has written extensively for the church and the organ, as well as a considerable amount of orchestral and chamber music. His style is tonal and very accessible for the listener but technically difficult for organist and choir. The organ music demonstrates a very clear concept of the instrument as a constant source of color and drama, while the choral music (at least on this disc) displays a fascinating ability to evoke the mystery and drama of worship. There is depth and substance to his language – it is not saccharine religious fluff written for sugar-coated, feel-good services. This is music for worship, music to create an atmosphere of the divine. The Organ Sonata is a dramatic, virtuosic work well suited for recitals (it deserves more performances). The five sketches on Helmsley are united by a common theme and form a dramatic whole akin to a set of variations. In contrast, the Three Hymn Tune Preludes were written as practical church music. They are beautifully crafted and would be a welcome addition to any organist’s repertoire. The Fantasie-Aria is a tightly intertwined set of variations on St Elizabeth, rising to an intense climax in the middle that resolves tranquilly with a simple statement of the tune at the conclusion. The Prelude and Fugue is a neo-Hindemith approach to this classic form. The harmonies in the prelude have that acerbic quality, while the short fugue subject is handled with the same contrapuntal quality and skill. The choral music clearly demonstrates Moore’s exemplary skill for setting texts to music. Each combination is different but each is so right, so perfect for that text. ‘One thing have I desired of the Lord’ begins quietly, rises to a jagged climax on “and now shall he lift up mine head” only to return to the quietness of the opening text. ‘O quam gloriosum’ is just as dramatic, opening brilliantly with successive waves of sound, only to subside in tranquillity. Unlike Vaughan Williams’s setting of the Herbert text, which is flat-out exuberance all the way, Moore’s setting works in small waves, beginning each section quietly and rising to a renewed climax on each successive “My God and King”. The Three Prayers of Dietrich Bonhoeffer is one of the most intense choral works I have heard in a long time. The texts are taken from Bonhoeffer’s Prayers for Fellow Prisoners, which are extremely vivid and passionate even in translation. I cannot imagine a more perfect setting of these texts. Moore has picked up so much of the anguish of the texts; yet undergirding all of it is the essence of Bonhoeffer’s faith and acceptance of the will of God as his destiny. The performances on this disc are superb. Filsell’s playing is colorful, brilliant, yet completely lyrical all the time. His playing is sheer delight. The Vasari Singers are just as exemplary, with a rich, balanced blend. Backhouse has an exceptional sense of vocal color and rhythm that keeps the listener interested in the music. Add excellent and consistent engineering, and this recording is a “must-have”.